In 2014, I created and taught the first Trans and Genderqueer Literature course at the University of Arizona. 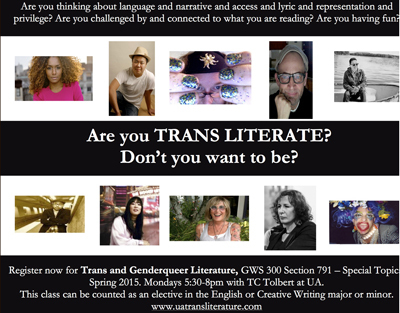 This 300 level course is focused on poetry, fiction, and creative non-fiction by trans and genderqueer authors. We explore a variety of theoretical, cultural, and political contexts as we analyze the evolving literary discourses on trans and genderqueer experiences. Feel free to use my syllabus and/or course materials here. 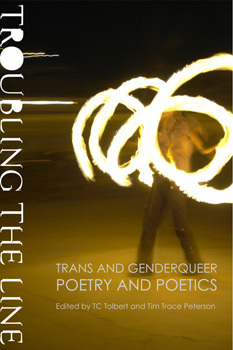 The first-ever collection of poetry by trans and genderqueer writers, co-edited by TC Tolbert and Trace Peterson. The first of its kind, Troubling the Line: Trans and Genderqueer Poetry and Poetics, gathers together a diverse range of 55 poets with varying aesthetics and backgrounds. In addition to generous samples of poetry by each trans writer, the book also includes “poetics statements” – reflections by each poet that provide context for their work covering a range of issues from identification and embodiment to language and activism. "Speech Acts" is a video poetry series I produced in collaboration with Noah Saterstrom and Trickhouse. More than an archive, "Speech Acts" seeks to create an intimate, human experience with Tucson trans and genderqueer poets and their work. Click here to go to videos of Samuel Ace, Ian Ellasante, Hannah Ensor, and Huck Arteaga. 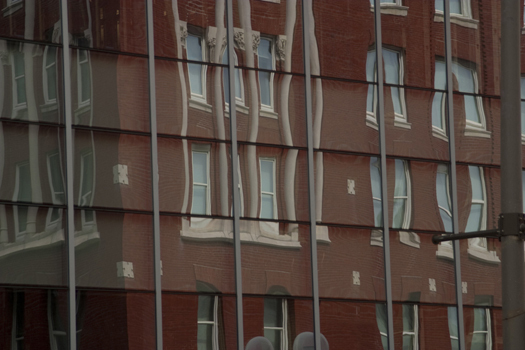 THE VOLTA is a multimedia project of poetry, criticism, poetics, video, conversation (audio), and interview (text). Evening Will Come is the poetics section of the Volta. 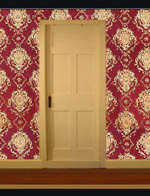 In December, 2012, I curated a trans and queer issue featuring the work of 18 trans, genderqueer, and queer poets, visual artists, and filmmakers. Get ready to fall in love. I am a Trainer, Course Director, and Lead Instructor for Outward Bound. I have been with Outward Bound for 13 years and in the last 6 years I’ve had the opportunity to lead Grieving Teens trips for Outward Bound. These are 7 day courses specifically designed for teens coping with the death of a loved one. If you know a youth who has experienced the death of someone close, please have them contact Outward Bound and connect them with this exciting, healing opportunity. Full scholarships are available. 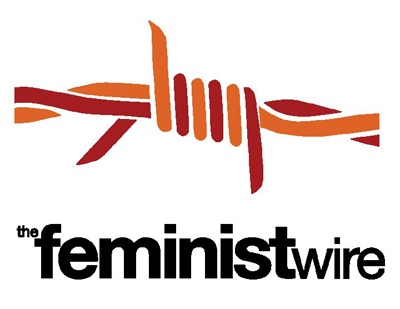 I am an Associate Editor of Arts and Culture for The Feminist Wire - an online community committed to providing socio-political and cultural critique of anti-feminist, racist, and imperialist politics pervasive in all forms and spaces of private and public lives of individuals globally. I am the founder and Artistic Director of Made for Flight, a transgender youth and ally empowerment workshop series designed to celebrate youth voice and resiliency. 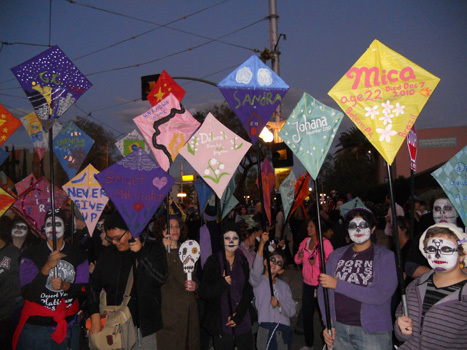 We integrate transgender history, ally development, creative writing, and kite building to commemorate the lives of transgender individuals who have been murdered in the last year. Made for Flight is generously funded by the Alliance Fund, Kresge Foundation, and Tucson Pima Arts Council – thank you! It is my hope that Made for Flight will encourage those of us with privilege (and there are many kinds of privilege in this world - white, straight, passing, male, the list goes on) to use that privilege to speak out, call out, and act out against transphobia and other forms of oppression. We cannot talk about transphobia and ignore the fact that the majority of those we commemorate on Transgender Day of Remembrance are transwomen of color. Racism, sexism, classism, homophobia, and transphobia are inherently inter-related and we must work in solidarity with one another to overcome them all. To find out how to bring Made for Flight to your campus click here. 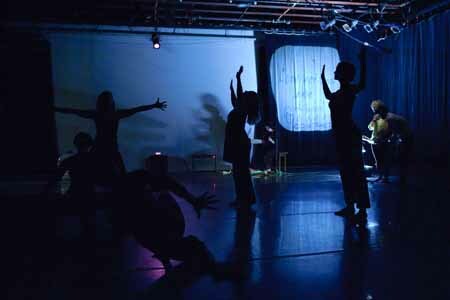 I am a member of Movement Salon, a group of movement artists, writers, and a musician who practice and perform the art of compositional improvisation. That is, we pay close attention to one another as we simultaneously create. Our only parameters are space and time. We make the rest up, each and every time. All of it. While this could seem silly or opaque, the work is not about joking or careless “whatever happens” philosophy. Instead, we practice the Four-Fold Way: show up, pay attention, tell the truth, and be open to outcome. With this in mind, we work to create instantaneous and ephemeral compositions that explore the relationships between movement, sound, and text; bodies and space; choice and responsibility; and self and others. Dancer and co-founder, Jennifer Hoefle, says, “We believe that the act of attention is transformative.” Because of this, the pieces can feel quite risky. And I guess they are. The lifts are not choreographed, the music is not set, the words are not memorized, and neither the beginnings nor endings are planned. “Choosing is another word for composing. We choose to create something and then we choose to allow it to change,” says Kimi Eisele, dancer and co-founder. Life changing, really. I am so lucky to be a part of this.